Technology is a double-edged sword. On the one hand it contributed to the increase in sedentary lifestyle across different age groups and socioeconomic levels. On the other hand, the widespread of fitness technology such as smartphone applications and wearable technologies offers innovative solutions to increase and promote physical activity. Currently, more than 6.8 billion people worldwide use mobile phones. A 2013 analysis revealed that there are over 40,000 health and fitness apps currently available to the public via iTunes (e.g., Map My Walk, Runkeeper, My Fitness Pal), and over half of smartphone users report having downloaded such applications. Pedometers, count and monitor the number of steps taken during ambulatory activities such as walking, jogging, and running. They can also estimate distance and caloric expenditure but these measures are often less accurate. Pedometers can be carried in a pocket or a bag held close to the body but for more accurate counting they need to be attached to a waistband, around the ankle or in a shoe. Accelerometers: record body acceleration minute to minute, providing detailed information about the frequency, duration, intensity, and patterns of movement. They are relatively more expensive than pedometers and used more widely in research. Heart rate monitors: are used primarily to assess exercise intensity for individuals with cardiac conditions and highly trained competitive athletes. These devices can also estimate the exercise energy expenditure. Smart Fabric and Sensor Technology provides monitoring systems which can remotely record/monitor physiological responses; these systems are fully integrated within clothing. Interactive video games such as Dance Dance Revolution (DDR), Wii Sports, Wii Fit, Sony Play Station, Xavix, and EyeToy games. Fitness trackers such as Fitbit, Garmin, Xiaomi and Misfit. Similar devices come in different prices and functions. 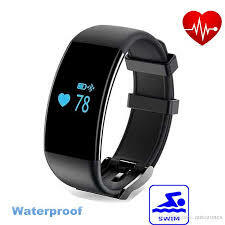 They can monitor daily steps, heart rate, sports activities and sleep statistics. The data from these trackers can be packed up on the user’s online account so that they can monitor their personal goals and share them with their health care provider. Another study showed 27% increase of physical activity levels reported by pedometer user. Pedometer-based walking programs were also associated with significant decreases in body mass index, body weight, and systolic blood pressure. Many fitness centres and schools are now offering interactive games to promote physical activity of children, adolescents, and older adults by utilizing interactive games. Warburton and colleagues reported that interactive video game cycling significantly increased steady-state HR and energy expenditure compared to traditional cycling at constant, sub-maximal workloads. Interactive games are not exclusive for children but also hold promise for promoting functional independence, improving balance, preventing falls, reducing premature disability, and maintaining health by increasing the physical activity levels of adults and seniors (deJong 2010). Balance confidence, mental health, and timed walking along a narrow path improved for the seniors who completed a 3 months video dancing intervention (30 min per session, twice weekly) . Fitness technology often utilise behaviour change techniques such as goal setting, feedback, rewards, and social factors. 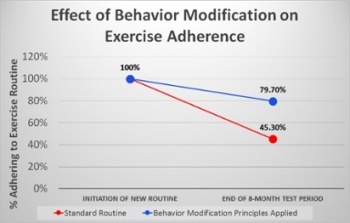 Tackling behavioural modifications can increase the individual's adherence to physical activity. Providing feedback is essential for tracking goals and increasing activity levels. Reminders, text messages and real-time alerts are examples of feedback tools used by fitness apps. Fitness trackers may also vibrate, make a noise, or display a congratulatory message or friendly face when a goal has been reached. Users can share their progress with their friends on social media easily which was found to be a great motivational tool. Some smartphone applications provide professional virtual reality coaching to motivate increases in physical activity. Technology-based fitness tools provide a relatively cheaper alternative to objective research tools. Furthermore, they are user friendly and provide simple meaningful data to users. Studies found that fitness trackers including the wrist-worn Fitbit and Fitbit Ultra and the waist-worn Fitbit One have acceptable reliability and validity comparable to research–standard devices in the lab. Physiotherapists and other healthcare professionals can encourage their patients to use trackers and/or smartphone applications to increase their activity levels. This blog post is written by a Physiotherapist and it explores the potential of Pokemon Go to stimulate physical activity. Over time, less active users are more likely to abandon these devices and go back to old habits compared to more active users. Some have even suggested that more than half of fitness tracker owners abandon their devices within the first month . To promote adherence, it is encouraging that fitness technology often includes behavioural strategies such as barrier identification and action planning. Such strategies would allow the user to examine their schedule for the day and determine times in which they can increase their exercise. They can then make a specific plan for how they will increase their activity. These behavioural strategies can help one increase both perceived control over exercise behaviours and exercise self-efficacy. The placement of the tracker on the body is a subject of debate, with some areas more accurate than others, and recommended placements may change with age. Diaz and colleagues also found that the waist-worn Fitbit Flex and the hip-worn Fitbit One were reliable when compared to researcher-measured step counts and estimates of energy expenditure (EE) and suggest that the hip monitor was more accurate than the wrist. There are some viable options for providing fitness trackers to large, diverse groups of people. For instance, many companies have started providing fitness trackers to their employees for free or at a reduced price. In one study, fitness trackers increased productivity and decreased the amount of sick days taken , suggesting the powerful potential if adopted by more companies. Recent reports suggest that many doctors are now prescribing exercise to their patients with chronic health conditions such as diabetes, hypertension, or cardiovascular disease. If fitness trackers were covered via health insurance, it could help both doctors and patients track day-to-day exercise, along with other metrics like diet, heart rate, or sleep. Such programs may be able to connect doctors to patients in ways that were not previously possible. ↑ Paradiso R, Pacelli M. Textile electrodes and integrated smart textile for reliable biomonitoring. Conf Proc IEEE Eng Med Biol Soc. 2011;2011:3274-7. doi: 10.1109/IEMBS.2011.6090889. ↑ Shih PC, Han K, Poole ES, Rosson MB, Carroll JM. Use and adoption challenges of wearable activity trackers. In Proceedings of the iConference, Newport Beach, CA (2015). ↑ Robinson SA, Lachman ME. Perceived control and behavior change: a personalized approach. In: Infurna F, Reich J, editors. Perceived Control: Theory,Research, and Practice in the First 50 Years. New York, NY: Oxford University Press (2016). p. 201–27.